Although they use the same technology, there are major differences between residential and commercial heating systems. We considering the installation of a new heating system, you need to think about the size of the heated space, what is being heated, and the location of the heating components. 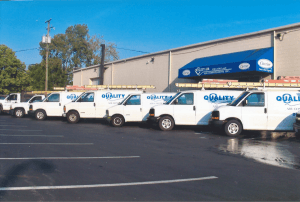 More importantly, always consult with your Columbus heating repair and installation professional at Quality Air Heating and Air Conditioning. We are experts in both residential and commercial heating and wanted to share some of the differences between the two systems. Size. Generally speaking, residential heating systems are much smaller than commercial systems. They tend to require less space, and they often don’t require as much energy. Commercial heating systems for restaurants and large office buildings require much greater BTU capabilities than a two bedroom home. Sizing is a critical process in planning and designing a heating system for your home or business. An improperly-sized unit will not be able to match the heating requirements of the space. Purpose. Residential heating systems are specifically designed for homes and are intended to heat you and your family. Commercial heating applications may require much more subtle temperature differentials than homes typically do. There may be further considerations related to keeping products or certain rooms at much different temperatures than the rest of the building. Location. Commercial heating systems are often placed on the rooftops of buildings. This is rarely the case in residential split systems where the condenser is placed outdoors while the evaporator and air handler reside indoors. But packaged units are becoming more popular in residential applications, and split systems are occasionally used for smaller commercial applications. It all depends on the size and heating needs of the client. These are just a few things to keep in mind about the difference between residential and commercial heating systems. If you further questions about this distinction or would like some advice about how to best approach your project, call the Columbus heating repair and installation experts at Quality Air Heating and Air Conditioning.